In 1888 the 16-year-old Gurdjieff witnessed a strange incident: he saw a little boy, weeping and making strange movements, struggling with all his might to break out of a circle drawn around him by other boys. Gurdjieff released the boy by erasing part of the circle and the child ran from his tormentors. The boy, Gurdjieff learned, was a Yezidi. 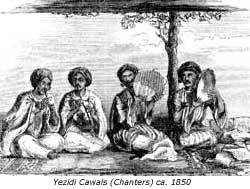 He had heard only that Yezidis were "a sect living in Transcaucasia, mainly in the regions near Mount Ararat. They are sometimes called devil-worshippers." Astonished by the incident, Gurdjieff made a point of telling us that he felt compelled to think seriously about the Yezidis. (1) Inquiring of the adults he knew, he received contradictory opinions representative of the usual, prejudiced view of the Yezidis. But Gurdjieff remained unsatisfied. Where does this incident happen? 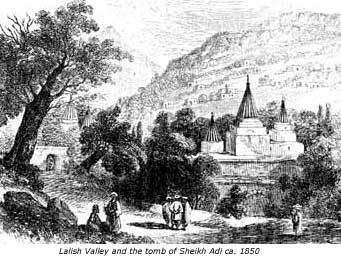 If we set out Gurdjieff's journey with Pogossian on a map and, following Gurdjieff's instructions, draw a line from Alexandropol through Van, we see it passes through the Lalish Valley, location of the tomb and shrine of Sheikh Adi, the principal saint of the Yezidi religion. Extending the line further, it reaches Mosul, the major town in the region and a center of Yezidism. (3) By setting such markers, is Gurdjieff advising that we too should "think seriously" about the Yezidis? Gurdjieff has said that the teaching he brought is completely self-supporting and independent of other lines, was completely unknown up to the present time, and its origins predate and are the source of ancient Egyptian religion and of Christianity. Why then, has he as much as asked us to look into Yezidism? Some, swayed in a superficial sense by the subtitle of Ouspensky's book, Fragments of an Unknown Teaching, went hunting for the "missing link" in Gurdjieff's supposedly incomplete teaching. They tried to find this or that source from which he put it together, little realizing that it was they who were fragmentary, not the teaching. The questions become instead: what ideas do we encounter in a study of the Yezidisand do these tell us anything? As we acquaint ourselves with the Yezidis and their beliefs, we may see that Gurdjieff has led us to materials for a deeper understanding of the nature of an esoteric teaching, of the implications of a teaching transmitted "orally," and of the reasons for his unlikely choice of Beelzebub as the hero of the First Series. The story of the Yezidis can be traced back more than four thousand yearsbefore they came to be called Yezidisuntil the trail disappears into an unrecorded 'prehistory.' Based on few accounts, and those often contradictory, it is complex and difficult to follow. Here we see some of the problems commonly encountered in attempting to understand the Yezidis. The first, and apparently the easiest to grasp, is their legendary secrecythe keeping of their beliefs and practices hidden for fear of persecution for holding beliefs and practices that lie outside the sphere of orthodox approval. Again and again, they resisted conversion to Islamor Christianityexcept when they took on the outward forms for a period of time to avoid certain destruction. The word Yezidi(7) is used as the name of a tribal group (several tribes, really) and a religion practiced by that tribe. The first time the name appears in writing is in the eleventh century A.D. 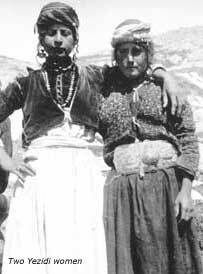 There are many theories about its origin, each more or less likely, but for different reasons, so it is not known when they first were called Yezidis or why. Some consider the name stems from Ized (angel, God) or Yazata (worthy of worship), words found in the Avesta, the sacred writings of the Zoroastrians and the Parsees. (8) Most Muslim writers believed the Yezidis are admirers of the Umayyad Caliph Yazid ibn Mu'awiya who was responsible for the death of the Prophet's grandson, Hussein. The younger son of Caliph Ali by the prophet's daughter Fatima, Hussein refused to swear allegiance to Yazid when he became Caliph. In 680 A.D., on his way from Medina to join supporters of Ali's family, Hussein was waylaid in the desert by agents of Yazid and killed. Because of the belief in the Yezidis connection with Yazid (who was hated by the Shi'ites, the "partisans of Ali," and not well thought of by Sunnis either), Yezidis were hated and persecuted. There was, indeed, in the Kurdish mountains a religious movement which venerated Yazid and the Umayyad dynasty, but it isn't known if the Yezidis were part of it. The edict was as honored in the breach as in the observation. In 1894, the Ottomans sent an expedition against Jebel Sinjar to convert Yezidis to Islam. Although the Yezidi villages on the lower foothills were burned, many Ottoman soldiers were killed and the expedition failed. The last Ottoman attacks on the Yezidis came at the end of the First World War. In September 1918, the Ottomans hammered their mountain refuge, the Jebel Sinjar, with airplanes and cannon, but that expedition, too, failed. The connection with Caliph Yazid and the absence of a revealed book were more important in stigmatizing the Yezidis as pariahs before their later association with the devil. The accusation of devil worshipthat by which they are principally known todaycomes only at the end of the eighteenth century. It isn't mentioned, for example, in an account written in the late sixteenth century (that does refer to their connection with the Yazid faction), nor is it mentioned in an otherwise slanderous account written by a Turkish traveler fifty years later; nor in fatwas (religious edicts) issued against them in the early eighteenth century. It was not until the end of that century that the accusation was first made. By all rights the Yezidis should have been known as angelnot devilworshippers. No matter what the origin of the name, the primary associations for the word are similar. This is true whether the word is derived from the Persian, Izd, or a variant such as Azidi, Izidi, Izdi, or Yazata and Ized, or Yazd in Pahlavi, or Yajata in Sanskrit. All of these terms generally mean "worthy of worship," usually referring to an angel who intercedes between God and man, supervising the affairs of men after creation. Yezidis seem to be mostly Kurds, who speak Kurdish not Arabic. But they probably have Persian, Assyrian, Armenian, and Arab forebears as well. Traditionally they lived in Iraq, Syria, and Turkey. 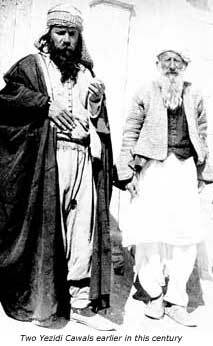 At the time Gurdjieff resided in the East, the religious life of the Yezidis centered in Baadri and the Lalish Valley, about fifty miles north of Mosul, and about one hundred miles north of Baghdad. When persecuted, the Yezidis traditionally sought refuge in remote, hard-to-access regions such as the Jebel Sinjar, a range of mountains in the middle of the desert, one hundred miles west of Mosul. Other communities settled in Kars and Erivan in Russian Armenia, and in Tiflis in the Caucasus. No one knows how many Yezidis there are: Yezidi men have always hidden from census takers to avoid conscription for military service. In the eighteenth century there were upwards of one million. Today, there are perhaps one hundred- or one-hundred-fifty or two-hundred-fifty thousand. Many have been slaughtered or displaced from their traditional homelands in northern Iraq by the current unrest in the region. Many have emigrated in recent years from Turkey to Germany. (1) G. I. Gurdjieff, Meetings with Remarkable Men (New York: E. P. Dutton, 1950), pp. 6566. (4) Sami Said Ahmed, The Yazidis: Their Life and Beliefs (Field Research Projects, 1975). (7) Principal sources for the "facts" of Yezidis and Yezidism are: Ahmed, The Yazidis; Gibb and Kramers, The Shorter Encyclopedia of Islam (Cornell University Press, 1974); John S. Guest, The Yezidis: A Study in Survival (KPI, 1987); and Phillip Kreyenbroek, YezidismIts Background, Observances and Textual Tradition (Texts and Studies in Religion, Volume 62, The Edwin Mellen Press, 1995). (8) The Yazidis, p. 2223. (9) The Yezidis: A Study, p. 100.